Why are license plates for bicycles no longer used? 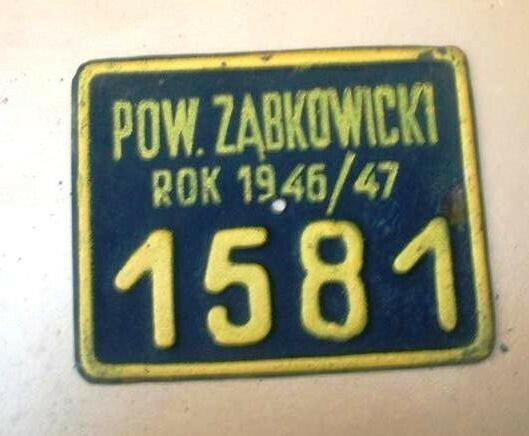 Bicycle license plates were quite common in many countries before, during, and, depending on the region, also after WWII. In Poland, for instance, it was obligatory until the late 60s. I've found that in Switzerland some kind of license plates (Velovignette) were still in use until 2011. I'm curious why countries retired such regulations, and what are the pros and cons of that situation. I'd like also ask if there are still some countries that require cyclists to register their bikes with some authority and/or are obliged to have insurance etc. As you have pointed out, in some societies and at some times, there were perceived benefits. These ranged from every road user is treated the same to we control every aspect of our citizens' lives, and we create jobs for everyone, as well as we'll punish those who make the slightest transgression. As you may be aware there are always some sections of society, somewhere in the world, calling for bicycles to be regulated. Cyclists are often seen to be anarchic by conservative people. If you read conservative to mean those in power or older, rather than right wing you get a more balanced view. And if you read anarchic as young it makes more sense: many older people forget how youth behaved in their day. From time to time such regulation are imposed. To date they have always (and I predict in future) fallen into disuse, because the cost outweighs the benefits. The license plates for bikes were tied to the taxation of bikes. You needed to get a new plate every year. The taxation lasted until WWII. The Germans abandoned the tax. After the war the tax wasn't introduced again so the plates were no longer needed. It was speculated that after the war the taxing of cars more then made up for the not taxing of bicycles. The City of Toronto required bicycles be licensed from 1935 to 1957. According to a City of Toronto web page on the topic of bicycle licensing part of the reason given at the time for repealing the by-law was "because it often results in an unconscious contravention of the law at a very tender age; they also emphasize the resulting poor public relations between police officers and children." The cost of obtaining a license to drive a motor vehicle is considerable. Much of that cost covers the administrative costs of maintaining an accurate database, and processing licenses. The costs of developing a system for cyclists would be similar. When asked to consider such a move in the past, the Ministry of Transportation has rejected it. If cyclists were asked to cover the cost of licensing, in many cases, the license would be more expensive than the bicycle itself. Many children cycle, in fact most cyclists are young people. It would be difficult to create one standardized test that could be used by adults as well as children as young as five years old. There is an argument to be made that licensing would allow an opportunity for education, but again the bureaucracy of such a mandatory system has been seen as too cumbersome to develop. The discussions about cyclists and the law have raised the question about how we want our police to spend their time and limited resources. Do we want them checking up on and enforcing licenses, or do we want them enforcing traffic laws? Most people would argue that enforcing traffic laws is more worthwhile. Police who have been involved in the studies of licensing have determined that the HTA already gives them the necessary tools, such as Section 218, to do the enforcement job. In each of the above cases, major problems and difficulties arise in establishing a licensing system. The studies asked what is the goal that licensing cyclists is attempting to achieve? If the goal is to increase cyclists' compliance with traffic laws, and to reduce the number of conflicts with pedestrians and other road users, then licensing as an approach needs to be compared with other possible initiatives. Is the creation of the major bureaucracy that licensing would require worth it? The studies have concluded that licensing is not worth it. Other solutions: blitz enforcement of rules on riding on sidewalks, public awareness campaigns, skills training through CAN-BIKE, and the provision of bicycle-friendly facilities, such as bike lanes, while not perfect, are more effective in meeting the goals of cyclist compliance with traffic laws than the investment in licensing. Concerns over cyclist compliance with traffic laws are real, and require ongoing attention. If, however, major investments are to be made by governments or by cyclists themselves, then the overall public policy goals behind that investment need to be addressed. For example, there is a strong public policy case to be made for licensing motor vehicle drivers. Hundreds of lives are lost each year because of motor vehicle crashes and collisions, and many thousands more are injured. Cyclists are involved in a smaller number of incidents, which must be addressed. However, given the benefits of cycling to health, the environment, and the community, on-going efforts to increase cycling compliance with traffic laws must be a part of an overall strategy to promote safe cycling. So in Toronto at least, licence plates are no longer used because they basically cost too much for too small of a benefit. Indeed overall it would probably be harmful, as it could dramatically reduce the number of people riding bicycles. Come election time its most likely vote loser: politicians are not prepared to take on cyclists for little benefit. Further, it has the potential to take on a life of it own and really blow up in their faces. If you were a politician (who are the law makers in most jurisdictions), would you risk it? See this headline: Cycling laws: NSW to become 'laughing stock of the world' over push for bike riders to carry ID. And that is just making cyclists carry ID, not register bikes. The Velovignette was not a registration of the bike as such, like a car registration plate. Instead, you were required by law to hold liability insurance for damages you might cause while riding a bike, like scratching a car's paint. Your insurance would issue a small sticker that you would put on your bike to show that the bike was indeed insured. Riding a bike without such a sticker was liable to a fine of 40 CHF (roughly 40 USD). The sticker carried a unique number, so you could link it to the insured person, and you needed to get a new sticker (i.e., pay the modest insurance premium) every year. As to why this was discontinued at the end of 2011: people nowadays typically carry general personal liability insurance, which also covers damages caused while riding a bike. Some insurers would directly issue a number of stickers to anyone holding their policy, whether or not the household had a bike. At some point, the Swiss legislature argued that administering the specifics of the Vignette scheme was not worth the hassle any more, and the Vignette was abandoned. The introduction and abolition of bicycle licensing laws should also be seen in the context of wider attitudes towards the role of authorities, how much the state should regulate peoples' lifes. This has changed over the years. There is a general trend for deregulation, for removing regulations where there is no clear benefit for society, making the state leaner. A similar example is licensing and taxes for dogs, which also have been abolished in many countries, probably for similar reasons - a lot of expensive bureaucracy, very little benefit, bad compliance and very difficult to enforce. Collisions with the cyclist at fault kill about the same number of people as dogs (one or two people per year in UK), so irresponsible dog owners, like irresponsible cyclists, are generally more a nuisance than a real danger to society, and the authorities nowadays don't see a need for strict regulation. I'd think you also find a lot of regulations in completely other fields (how to keep your front garden, for example) were once strict but have been relaxed. It seems to me that in earlier decades people generally thought that the state should regulate individual behaviour much more, and attitudes have become more relaxed since the 1970s and 1980s. Because a state with a welfare system actually "makes" money from every kilometre cycled (and loses from every kilometre driven by a motorist), mainly because bike riding keeps people fit and causes less pollution than driving cars, so it keeps healthcare costs down. The article mentions that politicians try to encourage bike riding by investing in bike infrastructure. Now we can guess that license plates would add bureaucracy and costs to bike riding which might turn people away from it, so bike license plates are probably a net loss for society. Not the answer you're looking for? Browse other questions tagged legal or ask your own question. Are public bicycle rack providers liable if your bicycle is stolen from their rack? Are runners or pedestrians allowed to use the bike lane? Why are bicycles considered vehicles and not “walking aid”? Are Velomobiles street legal in the UK? What is the braking (stopping) distance for bicycles? Is it legal for me to ride facing traffic on the sidewalk in California? Are New York pedestrians allowed to use bike lanes? What are your country's rules or regulations for the colors of reflectors or lights? Should unconventional colors be avoided for lighting?